Featured on Page 34, 56, and 69 in the Christian School Products 2016 Buyer's Guide ~ Purchasing Solutions for Religious Education Facilities. North Central Ballet recognizes MatsMatsMas.com as a partner. Corporate sponsor of the CAPE (Camarillo Academy of Progressive Education) Comet Run, a local school charity event. MatsMatsMats.com received a written thank you from Mary Jo Gordon, the Executive Director of C.A.R.E. Foundation for supporting the Heart Health Expo on December 13, 2010. We were also recognized / thanked in the event program and on LED signs during the Maggie Dixon Classic basketball games held at Madison Square Garden. We received a letter dated April 15, 2010 from Robbie Finke Franklin, Director of Marketing for The Breast Cancer Research Foundation (BCRF), thanking MatsMatsMats.com for its continued support and generous contribution from sales of our "Help Fight Breast Cancer" pink yoga mat. Robbie Finke Franklin of BCRF sent us another letter, dated January 21, 2010, thanking MatsMatsMats.com once again for its generous contribution from the sale of the "Help Fight Breast Cancer" pink yoga mat. Received a letter dated December 2, 2009 from Robbie Finke Franklin, Director of Marketing for The Breast Cancer Research Foundation (BCRF), thanking MatsMatsMats.com for its continued support and generous contribution from sales of our "Helpf Fight Breast Cancer" pink yoga mat. We received a letter dated July 15, 2009 from Robbie Finke Franklin, Director of Marketing for BCRF, thanking MatsMatsMats.com for its continued support and generous contribution from sales of our "Helpf Fight Breast Cancer" pink yoga mat. As a result of our continued donations from sales of our Pink "Help Fight Breast Cancer" Yoga Mats, we received a letter dated January 23, 2009, from Robbie Finke, Director of Marketing for The Breast Cancer Research Foundation, thanking MatsMatsMats.com for its support and generous contribution. We received a letter dated May 7, 2008 from Robbie Finke, Director of Marketing for The Breast Cancer Research Foundation, thanking MatsMatsMats.com for its continued support and generous contribution from sales of our pink yoga mats. Your company recently donated 25 yoga mats to a friend of mine who teaches children with learning disabilities in Chicago. I want to thank you for your support and as a physical therapist, will keep your website on my list for future reference. As a result of our continued donations from sales of our Pink "Help Fight Breast Cancer" Yoga Mats, we received a letter dated October 24, 2007 from Robbie Finke, Director of Marketing for The Breast Cancer Research Foundation, thanking MatsMatsMats.com for its support and generous contribution. MatsMatsMats.com was featured as a title sponsor at the 2007 Kids State Wrestling Championship and in the 2007 Kids State Championship publication organized by Team Georgia USA Wrestling. Received a thank you letter and email from Subhadra, the President and Founder of Your Kids Organization (YKO) and Yoga Angels, for our donation and support of their Red Carpet Benefit for Your Kids Organization and Beverly Hills Education Foundation on January 20, 2007. As a result of our donation from sales of our Pink "Help Fight Breast Cancer" Yoga Mat, we received a letter dated January 10, 2007 from Robbie Finke, Director of Marketing and Corporate Sponsorship for The Breast Cancer Research Foundation, thanking MatsMatsMats.com for its support and generous contribution. We received a "Thank you" letter from Westlake High School Wrestling for our support of their wrestling program during the 2006-2007 school year. 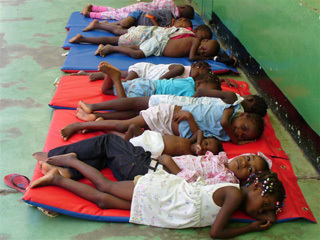 We received an email from John of the House of Hope saying: You may remember back in Feb or March I ordered mats that were shipped to Florida and then sent to an orphanage/TB clinic in Haiti. I am forwarding you an email and picture showing the mats in use - thanks again for supporting this project. As a result of our donation from sales of our Pink "Help Fight Breast Cancer" Yoga Mat, we received a letter dated August 3, 2005 from Robbie Finke, Director of Marketing and Corporate Sponsorship for The Breast Cancer Research Foundation, thanking MatsMatsMats.com for its support and generous contribution. As a result of our donation from sales of our Pink "Help Fight Breast Cancer" Yoga Mat, we received a letter dated May 9, 2005 from Myra J. Biblowit, President of The Breast Cancer Research Foundation thanking MatsMatsMats.com for our gift, hard work and support of BCRFthrough this promotion. Received card from Jean Costa of Seaside Yoga Retreat, that was signed by 27 women and read: Sandy and I want to personally thank you for your donation to the 1st annual Seaside Yoga Retreat. Because of your generosity, 27 women attended the retreat, several on scholarships. We were able to provide each attendee with a pink-ribbon logoed [help fight breast cancer] yoga mat... You have truly blessed the lives of some of the most courageous and strong women you would ever want to meet. We are so very grateful for your financial support and ongoing friendship. The yoga community sticks together. When a yogi is in trouble, we need to rally and help. So, when Annies Yoga Studio in Sherman Oaks, California called on MatsMatsMats.com to assist them in a time of need, we did. They greatly appreciated the MatsMatsMats.com donation of yoga products which they were able to use in a raffle at a Novermber 7, 2004 event to help raise money to save this socially responsible yoga studio from closing. As a result of our donation from sales of our Pink "Help Fight Breast Cancer" Yoga Mat, we received a letter dated November 5, 2004 from Myra J. Biblowit, President of The Breast Cancer Research Foundation thanking MatsMatsMats.com for its support and generous contribution. Aftrer placing her order, Shelly of Louisiana Himalaya Association said, "thank you for helping our non profit with this special pricing." During the Fall of 2004 MatsMatsMats.com and its products were featured in a display window outside Total Woman Gym and Atmosphere Day Spa located in the Promenade Mall in Woodland Hills, California. In July of 2004 Professor Sliverio Guerra founder of The Universal Martial Arts Hall of Fame (UMAHoF) personally contacted us to say thank you for our assistance. MatsMatsMats.com provided discounted pricing and expedited delivery of wrestling mats for The 2004 Universal Martial Arts Hall of Fame (UMAHoF) USA Expo in Florida. In June of 2004, for the second year in a row, worked with the City of Hope - Yoga for Hope by providing a "wonderful discount" on our yoga products. In June of 2004 sponsored Chicago Area Cancer Registrars Association (CACRA) Workshop which introduced Yoga and Pilates as a tool to be used by cancer patients to enhance physical and emotional wellness. CACRA focuses on cancer research and awareness. In May of 2004 MatsMatsMats.com worked with the City of Hope in San Diego by supplying them with yoga mats at deeply discounted prices. Received letter dated April 23, 2004 from Myra J. Biblowit, President of The Breast Cancer Research Foundation thanking MatsMatsMats.com for its support and generous contribution. In April of 2004 MatsMatsMats.com worked with Save The Bay, an organization designed to protect and restore San Francisco Bay and its watershed, by supplying them with mats to be used in their canoes.. In April of 2004 MatsMatsMats.com worked with the Healing Odyssey by supplying yoga mats for Cancer survivor retreats. Received letter dated February 13, 2004 from Myra J. Biblowit, President of The Breast Cancer Research Foundation thanking MatsMatsMats.com for its support and contribution. In December of 2003 MatsMatsMats.com assisted Team Lexus with their donation of wrestling mats and wall padding for an underpriviledged boys school in Maryland. In September of 2003 MatsMatsMats.com worked with Salt Lake Advocate in Salt Lake City Utah by supplying yoga mats for The Christmas Box House - a shelter for abused kids. MatsMatsMats.com was chosen as the source for yoga products by the director of Oncology of the Ronald McDonald Camp/Ronald McDonald House. MatsMatsMats.com provided yoga products for a new yoga program for teen campers in	Summer of 2003. After placing an order for yoga mats and tote bags for the 2003 City of Hope - Yoga for Hope event in Illinois Sarah wrote "Thanks for giving us such a wonderful discount!" In November of 2002 assisted the Tampa Bay Christian School by providing folding martial arts mats for their karate program. At a June, 2002 City of Hope AIDS and Cancer Research benefit in Seattle, Washington, MatsMatsMats.com was recognized for its assistance in providing yoga products for a 4-hour yoga class/workshop led by top instructors from the area. When placing her order Bonnie of Just for Kids in New York wrote "It's a pleasure working with such a nice company, and I will be sure to pass the word. Thank you!"